The Girl They Call Es: Dear Summer 2010. YAYYY!!! This is the single for my summer mixtape hosted by CultureObsessed.com and yours truly!!! 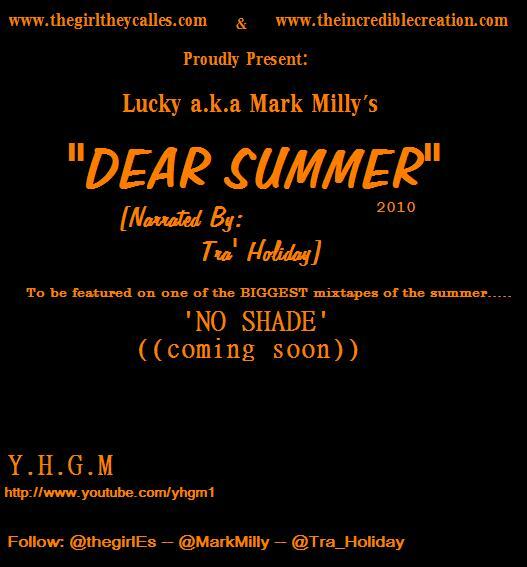 Shout to the homie Mark Milly for this dope single for the tape! DOPENESS!!!! No Shade is coming real real real soon!!! Artists on the tape include, Mark Milly, Chuck Good, Big Wayde, Rich Hil, Boo Bonic, Less, LaVish and plenty more!!! Still Accepting tracks for the mixtape so if you want to make track submissions, please send them to es@thegirltheycalles.com asap!!!! NO SHADE SUCKAS!!! We chillin, you sweatin! POW!